Earlier this year, NBC produced a TV show about the book of Acts, called A.D.: The Bible Continues, and it was an eye-opening and enlightening look at what following Jesus looked like in the early days of Christianity. I thought I would never look at the book of Acts the same way again. And I haven’t. In Into the Fray, Mikalatos retells some of the stories found in the book of Acts as if they were happening today. Because let’s be honest, how many of us encounter eunuchs today? (This was a particularly enlightening observation for me.) And how easy is it for us to read through these stories set in an ancient culture and walk away unchanged because they don’t seem to apply to us? Mikalatos is one of the best storytellers around. I’ve recommended his books My Imaginary Jesus and Night of the Living-Dead Christian more times than I can count. He has a way of creatively telling a familiar story in a way that offers fresh challenges. This book about the book of Acts clears any confusion Jesus followers might have about what the good news actually is and how to tell others about it. But it’s not a book about evangelism or outreach or preaching. It’s a book about transformation and how changed lives can turn the world upside down. 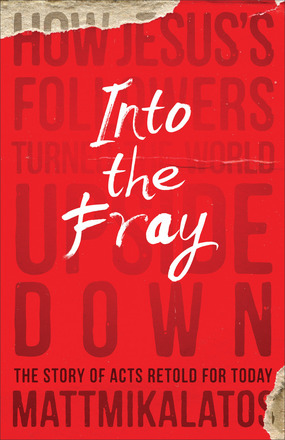 Into the Fray pulls the book of Acts into contemporary culture, and each chapter includes commentary from Mikalatos about context and application of the passage from Acts on which the stories are based. Fresh insights and relevant stories make this book a valuable study tool and resource for anyone who is engaging with the world around him. The book of Acts will look new to you like never before.